For some business owners, alternative, or non-bank, financing has appeal because it’s faster and easier to obtain than a loan from a big bank. But borrower beware. Especially entrepreneurs looking to establish, buy or grow a business. 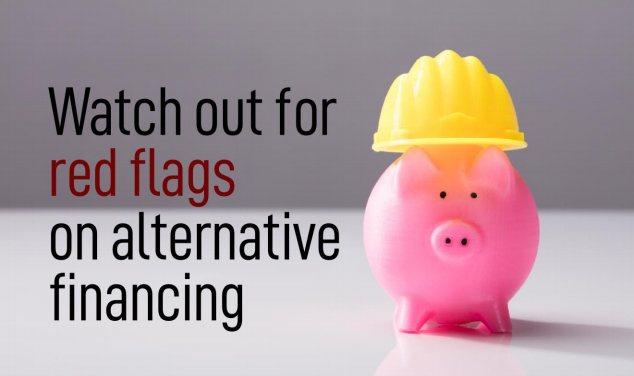 If you’re attracted to the benefits of alternative financing (and the benefits are numerous and compelling), do your due diligence before making any commitments. Like any major decision, you’ll need to weigh risks against potential rewards. And that requires knowing both sides of the equation. Sales pressure: The lender should be responsive to your timeframe—but shouldn’t be in a greater hurry than you are to close the deal. Take time to review the details with legal and financial advisors you trust. If the lender tries to rush you like a used car salesperson at the end of the month, refuse to be intimidated. If they pressure you further, walk. Sketchy online presence: A lender’s website reflects its business model. There should be a rich trove of data that establishes credibility—including details on their track record, customer base, outstandings, customer reviews, industries specialized in, employees, and contact information. And it should all be front-and-center, so you don’t have to search for it. The more unsupported hyperbole you see, the more likely you’ll encounter issues later. Lack of disclosures: You should be able to inspect the fees, terms and conditions, privacy policies and other boilerplate documentation on the company’s site. If it’s hidden, or unavailable until after you sign an agreement, insist on examining it early. And again, take your time and ask any pertinent questions. “Creative” amortization: Amortization has a major bearing on your total cost for the loan. You should know exactly what portion of each installment payment goes toward interest and what portion reduces your principal. Lenders can use a variety of amortization schedules. You want one that doesn’t unduly serve the lender. Financing with interest-only payments, in particular, can be deceptively convenient yet dangerous in the long term. Negative-interest features are even worse: after making timely payments for months, you could wind up owing more than you borrowed. Upselling: If a lender says you qualify to borrow more than you originally requested, it could be a sign that you miscalculated your requirements. But if they pressure you into borrowing more than you actually need, it’s a sign of trouble. The greater the pressure, the faster you should move on to another lender. Affiliations: If your lender is affiliated with the Better Business Bureau, local Chamber of Commerce or other reputable business organizations, the website should say so prominently. If it doesn’t, you should wonder why. Business is full of unintended consequences. Avoiding these red flags can help you steer clear of them. Be smart and review all the details in advance. At Expansion Capital Group, our professionals’ partner with you to craft financing that’s ethical, transparent and responsive to your needs. Contact us at (877) 204-9203 to learn about available options for establishing, buying or growing your business.